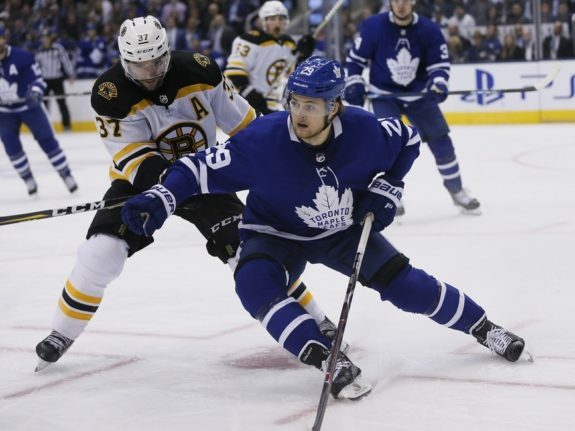 The Toronto Maple Leafs’ season is over after losing to the Boston Bruins by a score of 7-4 in Game 7 of the first round of the playoffs. The Leafs led the game a few times, up 1-0 and 2-1 in the first period and up 4-3 going into the third, but imploded in the final period, giving up four goals to lose the game. There’s plenty of hope for the future in Toronto but in the short-term, there’s plenty of blame to go around as well and it starts with Jake Gardiner and Frederik Andersen. Believe it or not, Gardiner’s night started off well as he had the primary assist on Patrick Marleau’s opening power play goal but the game went horribly wrong after that as he was on the ice for five of the Bruins’ seven goals and was directly responsible for three of them. The Bruins’ second goal of the game started like many of them, with a bad zone-exit by the Leafs. Gardiner dumped the puck into the neutral zone straight onto the stick of Adam McQuaid who fired it back into the Leafs’ zone. Gardiner was first to the puck but lost it to David Krejci and Rick Nash, who put it in front to Danton Heinen for the goal. On the Bruins’ third goal, Gardiner had the task of covering David Backes. Not an enviable task to be sure, but he did very little to pressure him when he had the puck and Backes used that time and space to easily find Kevan Miller for a point shot that took a classic weird Boston bounce onto Patrice Bergeron’s stick for the goal. The Bruins’ fifth goal, the game-winner, was the worst for Gardiner. Jake Debrusk was flying through the neutral zone and Gardiner needed to retreat but turned the wrong way, affording Debrusk all kinds of space to rush the net. There was an opportunity for Gardiner to slap the puck away as DeBrusk pulled it from his backhand to his forehand but instead, Gardiner went for the big hit and DeBrusk scored before he took the impact. The Bruins’ sixth goal was the most frustrating. Gardiner had the puck behind his own net for what felt like an eternity waiting for the Leafs to complete a line change. He started the breakout with all kinds of time and space but chose to fire the puck through the neutral zone, a play that had a low chance of going well given how much time he had. Again, the puck came immediately back into the Leafs zone and was in the net moments later with Gardiner desperately flailing to block the shot, getting in Andersen’s way in the process. Gardiner handled himself remarkably well in post-game interviews, fighting back tears as he took responsibility for the game. It’s pretty heartbreaking for a player that had a great season, scoring a career-high 52 points, tied for 15th in the league along with Morgan Rielly. He is under contract with the Maple Leafs for one more season and barring a surprising trade, will most likely have the opportunity to redeem himself in next year’s playoffs. Andersen’s Game 7 was similar to the series as a whole for him. He was magnificent at times and awful at others. Games 1 and 2 were terrible but the entire team was pretty bad so it was unfair to single him out. In Game 3, he let in two soft goals and was shaky in the first two periods but was spectacular in the third period, making a number of great saves including a save of the year candidate. Andersen took a step back in Game 4, allowing three goals on just 21 shots but he was great in Games 5 and 6 to push the series to Game 7. Unfortunately, he was more cold than hot in Game 7. He played really well in the second period, making 13 of 13 saves as the Leafs took the lead but he let in three goals each in the first and third periods, a number of which were soft. 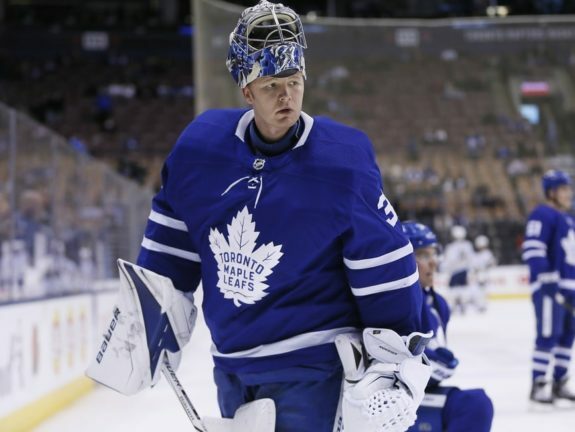 There may come a time when the Leafs roster is so good that they don’t need elite goaltending but for now, the Leafs go as Andersen goes and they need him to be more consistent for them to be contenders. Mitch Marner (Age 20): Marner was the Leafs’ best forward, leading the team with nine points. Auston Matthews (Age 20): Matthews had a disappointing series but we have to keep in mind that the Bruins’ defensive game plan was built around shutting him down and Boston is arguably the best team in the league at shutting down the opposing team’s best player. However, if Matthews wants a $10 million per year contract, he needs to be able to overcome that. William Nylander (Age 21): Nylander was far too soft and shied away from contact too much in this series. He needs to engage and win more battles so he can have the puck more and do Nylander-type things with it. Morgan Rielly (Age 24): If Marner was the Leafs’ best forward, Rielly was the best defenseman by far. He’s become a real leader. Travis Dermott (Age 21): Of all of the Leafs’ young players, Dermott appeared to be the most affected by the big stage of the playoffs and Mike Babcock limited his playing time accordingly. Like many of the Leafs’ defencemen, he struggled with zone exits and icings. I’m still high on Dermott for the long term. 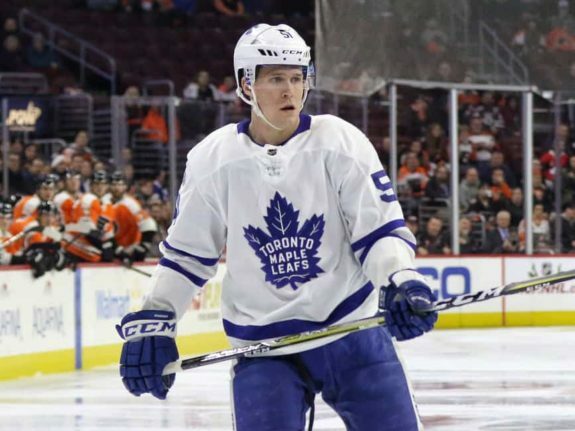 Andreas Johnsson (Age 23): Johnsson had an up and down series but he’s clearly earned Babcock’s trust and for good reason. He’s a responsible player with offensive upside and he’ll be on the Leafs’ opening day roster next fall. Kasperi Kapanen (Age 21): Kapanen couldn’t buy a goal for the first six games of the series but scored a beauty in Game 7. His speed caused the Bruins all kinds of problems but he needs to learn how to finish on all those breakaways. He will have a much bigger role with the Leafs next season. It’s no secret that the Leafs need help on defence. They struggled to win puck battles and exit the zone in a controlled way, committing far too many icings and often looking like they were killing a penalty. There are a couple big name defencemen that become free agents in the next two years, including John Carlson, Erik Karlsson, Drew Doughty and Oliver Ekman-Larsson and I expect the Leafs to pursue each of them.